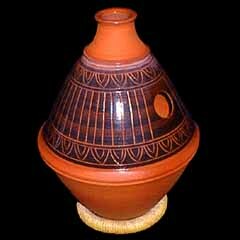 A clay pot drum of the Igbo People from Nigeria. The instrument has a few different names (abang) and is also played in parts of Ghana and recently versions have been made in Brazil. This particular version was designed by Stephen Wright of the Wright Hand Drum Co. in the USA and is called "ubang." The hand slaps down over the side hole to produce a variety of low, bass-like air sounds. The other hand taps on the clay shell much in the manner that ghatam (clay pot from India) players do.